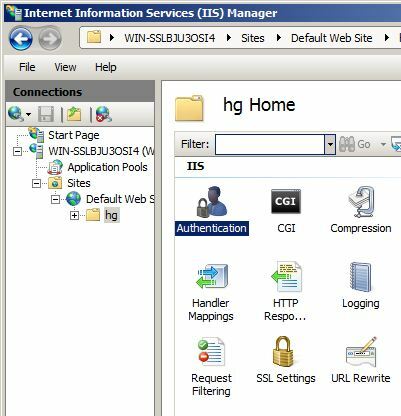 This guide walks you through setting up a Mercurial server under IIS7 on Windows Server 2008 R2. First you’ll need to download and install Mercurial. I won’t walk through this as it’s a simple case of pressing "next" several times. Next you’ll need to install Python. Note that you need to use the same version of Python that was used to build Mercurial. This guide uses Mercurial 1.4.3 with Python 2.5.4, but if you’re installing Mercurial 1.5 then you’ll need to use Python 2.6 instead. Be sure to install the x86 version of Python even if you’re running on an x64 system. Next you’ll need to download hgwebdir.cgi. 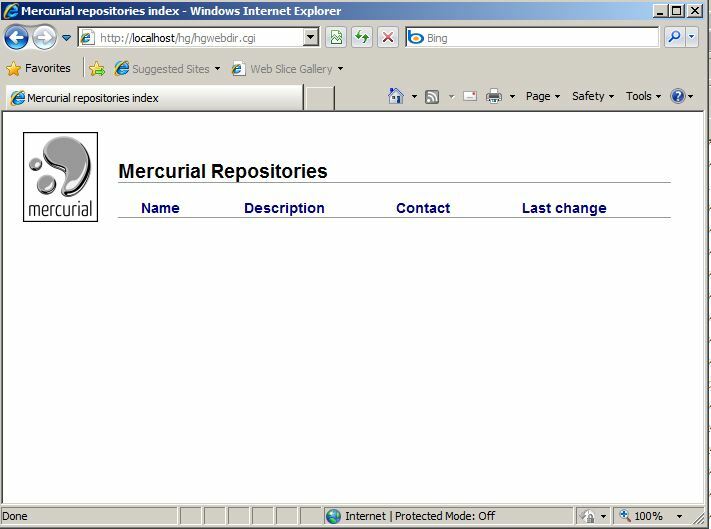 This is the python script that will allow serving Mercurial repositories through a web server. 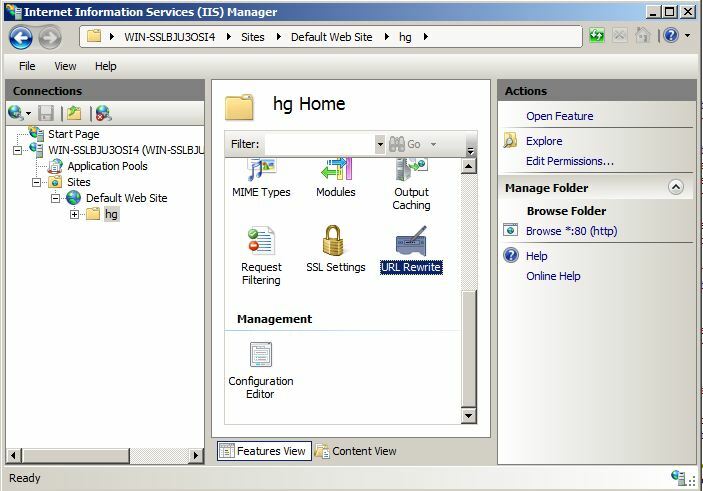 Once downloaded, hgwebdir.cgi is in the root of the source distribution. 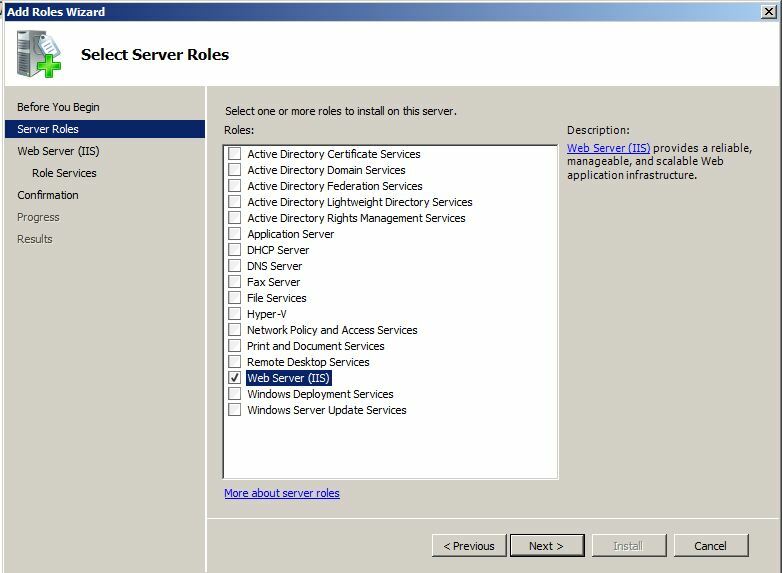 Under Windows Server 2008 you can install IIS under the Server Manager and clicking "Add Roles". 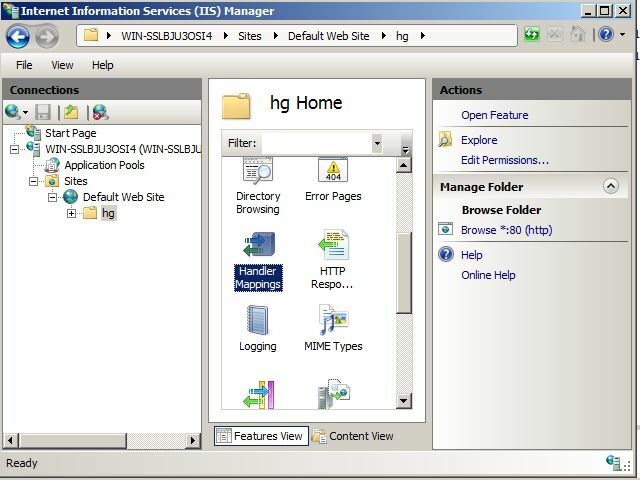 Proceed through the wizard and select the "Web Server (IIS)" role. 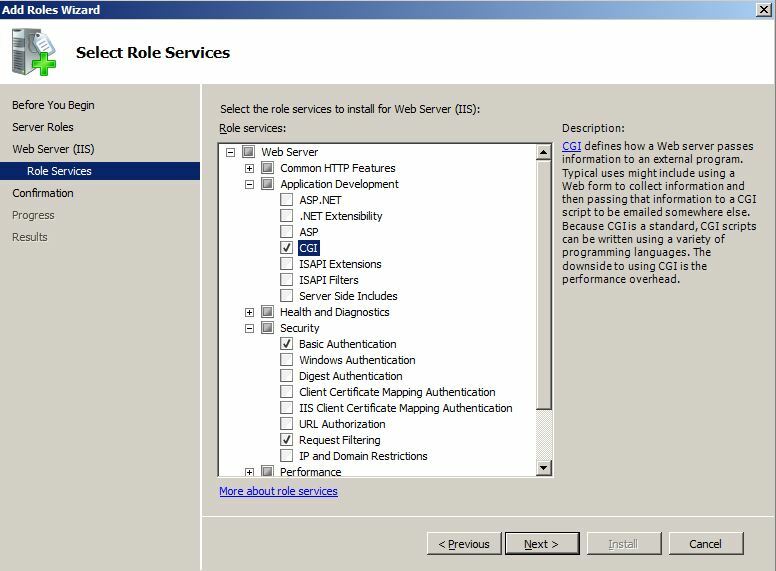 Under "Role Services" ensure that you enable Basic Authentication as well as CGI extensibility. 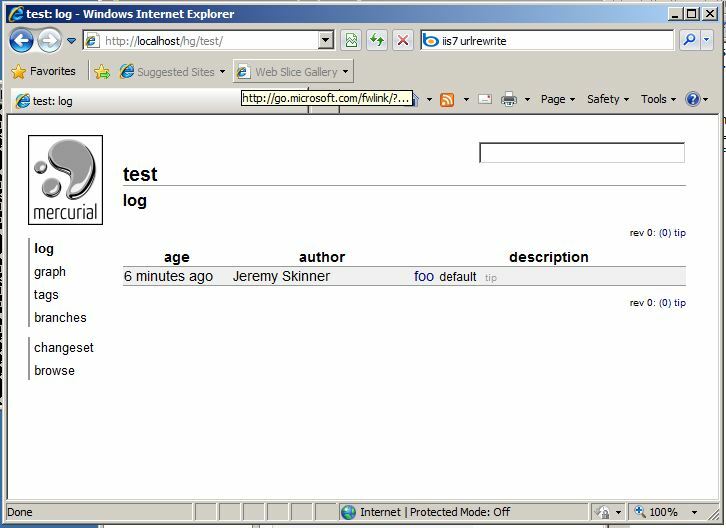 First, create a new directory under the wwwroot directory (C:inetpubwwwroot). I’m going to call it "hg". 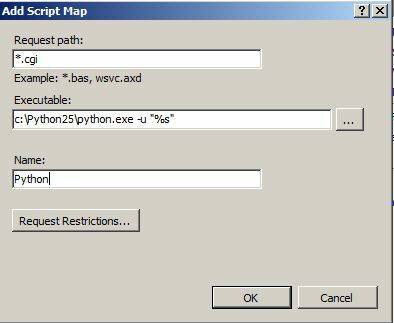 Next, enter *.cgi as the Request Path and the Executable Path should be set to c:Python25python.exe -u "%s". Enter "Python" as the Name. Next, you’ll need to unzip the Mercurial library into c:inetpubwwwroothg. 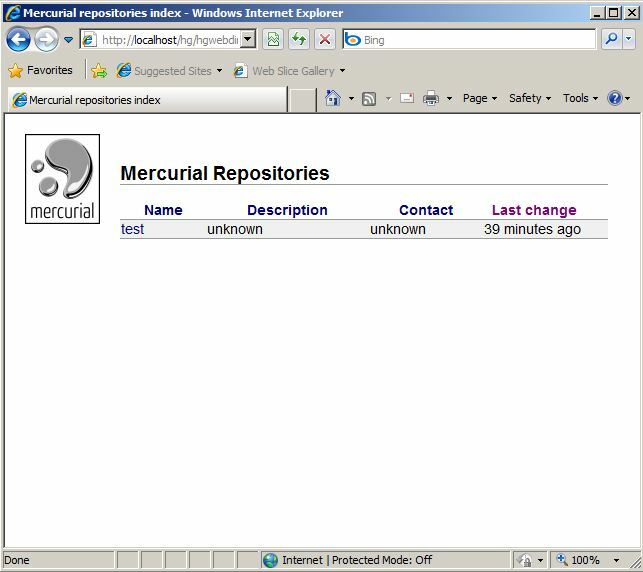 This can be found in Library.zip under the c:program files (x86)Mercurial directory. 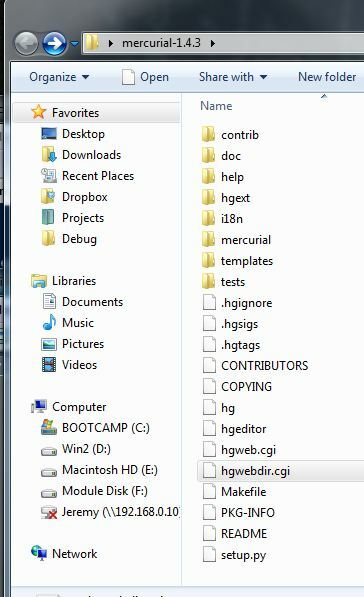 Finally, create a file called hgweb.config in c:inetpubwwwroothg. This file can be empty for now (we’ll be putting something in it shortly). Now you’ll need to create some repositories to publish. To do this, create a directory in the root of the C: drive called "Repositories". This is where our repositories are going to be stored. Personally, I don’t like having to specify "hgwebdir.cgi" in the URLs. 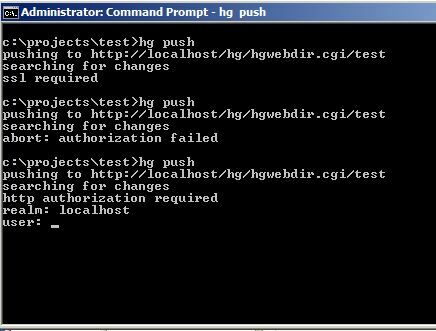 I’d much prefer something like http://localhost/hg/test to access my test repository. 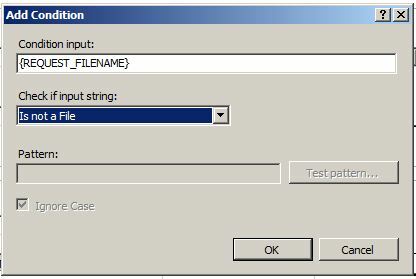 This can be achived by using the URL rewriting extension for IIS which can be downloaded from Microsoft. In the URL rewrite section add a new blank rule. The name of the rule is going to be "rewrite to hgwebdir". Under the "Match URL" section set "Using" to "Wildcards" and set the "Pattern" to "*"
Now, visiting http://localhost/hg will display our repositories page and http://localhost/hg/test will show our test repository. Likewise, we can now clone repositories using this url format. This means that the user account "Jeremy" (a local user account on the server) will have push access to the repository. 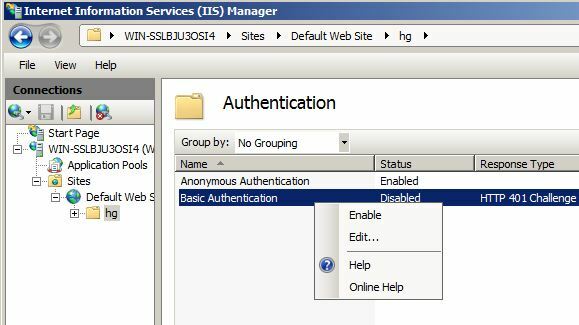 When you use Basic authentication, your username and password will be sent over the wire in plain text. To make this more secure we can enable SSL. 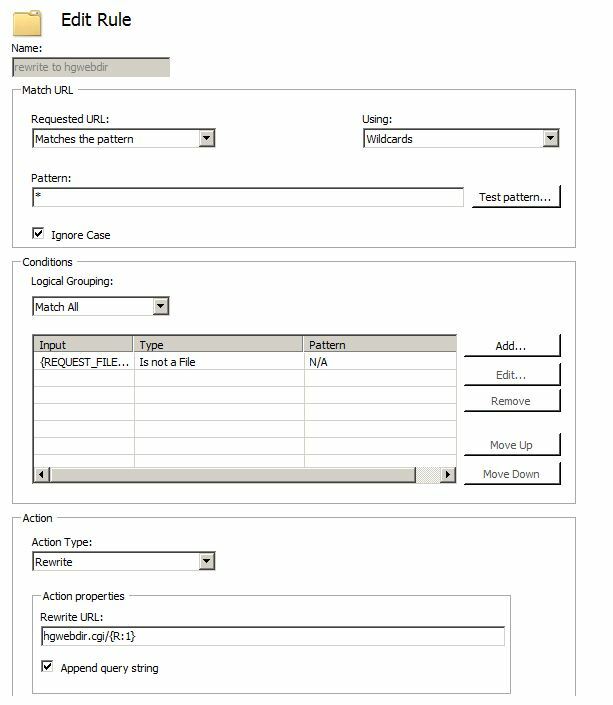 For this example I’m going to use a self-signed certificate, although this will also work with a real SSL certificate purchased from a provider. 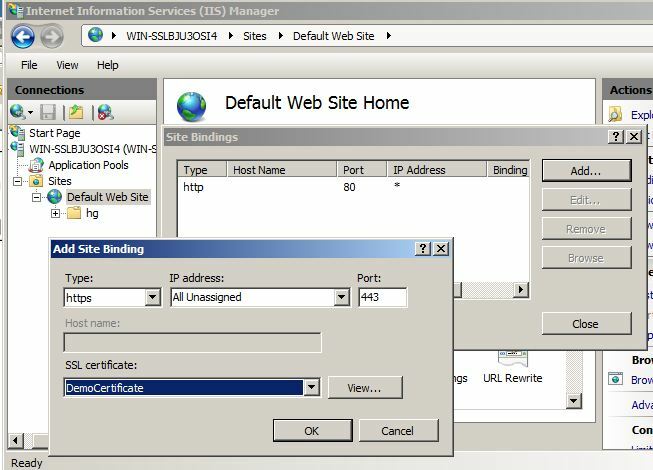 First, you’ll need to go into the IIS manager, select "Server Certificates" and click "Create Self-Signed Certificate"
Now, add a binding for your Web Site for https on port 443 by right clicking on the site and selecting "Edit Bindings". 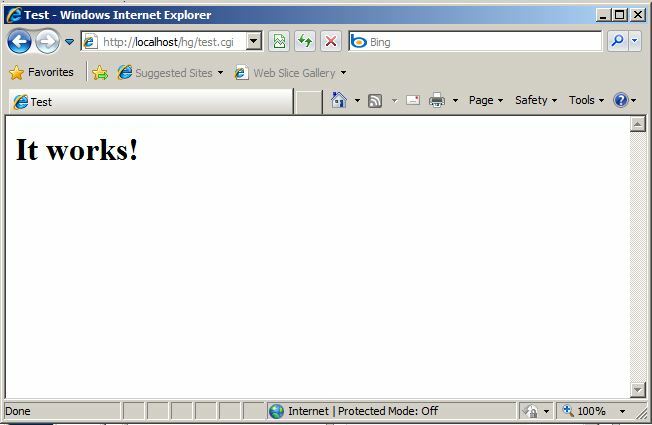 Once this is done, you should now be able to access the hgwebdir site by using https (https://localhost/hg). 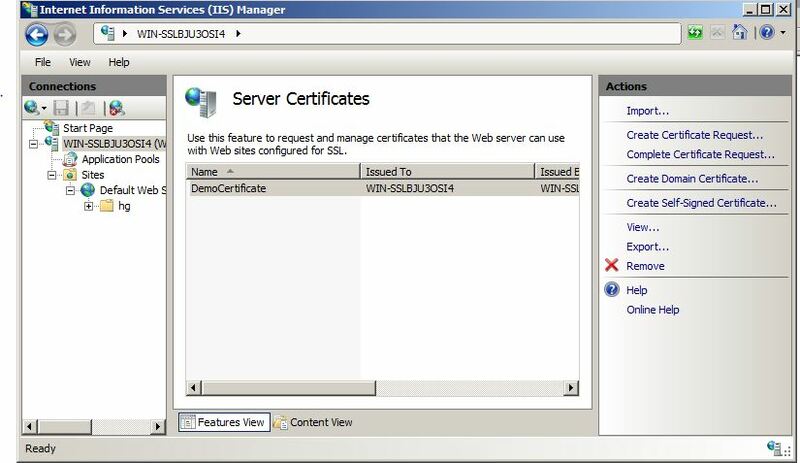 You’ll probably get an invalid certificate warning in your browser. 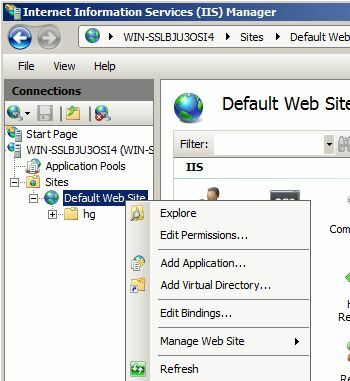 At this point, you should have successfully set up everything you need to use Mercurial in IIS7.